When considering a reverse mortgage loan in retirement, it is important to build your knowledge of the product in order to make a confident decision about whether or not it is right for you. At American Advisors Group, we have created a free 4-part Reverse Mortgage Guide with information about this powerful financial tool. You will find out about the advantages of a reverse mortgage loan and how it may help you, as well as reverse mortgage guidelines and what to expect. Also included is a pamphlet to give to your children or caregivers for their own knowledge, a retirement planner, and an educational video. Armed with this information, you’ll be one step closer to the best advice for a better life. Reverse mortgage loans are a powerful tool to help you access the equity in your home. There are many ways to use the funds you would receive: pay off credit card or medical bills, manage your retirement income, and plan your financial strategy. In our “Guide to Reverse Mortgages,” you’ll find answers to questions like how you can qualify, what are the income and credit score requirements, and reverse mortgage guidelines of borrowers’ obligations. Also, you’ll learn more about the consumer safeguards put in place by the Federal Housing Administration (FHA), as they strive to ensure the safety and strength of this government-insured financial tool. Children and Caregivers are a huge part of the decision, and they deserve to be just as informed. In our “Family Guide to Reverse Mortgages,” we address the loved ones closest to you who may wonder about what a reverse mortgage loan means for you and how it may affect them. This pamphlet will be their very own version of the Reverse Mortgage Guide. One of your greatest retirement assets is the equity in your home, and you want to use it in the most efficient and profitable way possible. In our “Reverse Mortgage Retirement Planner,” we take a look at the different ways you can use this loan to develop your retirement plans. Last but not least, we’ve included a special informative video. In it, we cover your most basic questions and concerns, as well as common misconceptions. We also share some reverse mortgage guidelines and explore how a reverse mortgage may be a great financial solution for you. 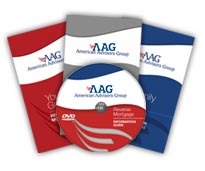 So sit back and take the time to explore American Advisors Group’s Free Reverse Mortgage Information Kit. It’s your perfect guide to a better life.